Bridget was born with an unexpected twin, Dennis in a thatched roof cottage, on the family farm in County Donegal, Ireland. Because the birth of twins was a surprise, a cradle was borrowed from some friendly, nearby neighbors, who were Protestants. Bridget was always full of interesting sayings: “The reason I am so contrary, I was rocked in a Protestant cradle” and “I came into this world with a man and I always hope to have a man nearby”. Her father was Charles McNulty, who dealt in horses, bringing them to market day to be traded or sold. Her mother was Bridget McKelvey, a hard working, beautiful lady who died in childbirth when young Bridget and her brother Dennis, were 9 or 10 years of age. Bridget never forgot the sight of her mother being carried out of the house, as she cried and sobbed. Her brother Dennis was raised by an Aunt and had a life a lot easier than his sister, Bridget. They did not see very much of one another during their childhood years. Bridget received her Sacraments at Killymard Church, in County Donegal. Some of the stories Bridget told her own children were of when she would walk home from school, in Ireland she took the freedom and shortcuts through royal grounds. One day, the lord apprehended her and told her to courtesy to him. She retorted with, “I courtesy to none but God Almighty,” frightened and promptly ran home. When she was older, she recalled of how she and her young Protestant male friend visited the Catholic Churches on Holy Thursday and lit candles. 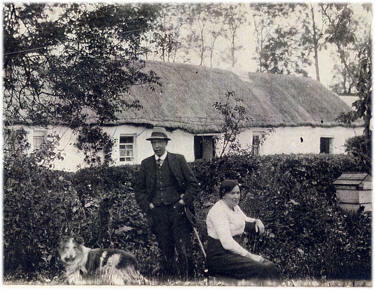 Bridget was particularly close and good to her sister, Maggie (McNulty) Colgan who had a farm in Altilow, Donegal. Maggie’s son, Danny, was a weaver of Donegal tweed on a home loom. Bridget was also close to her beloved Winifred McNulty, who left Ireland for Philadelphia. Winnie very possibly had Multiple Sclerosis and for many years a paralytic, who died young. Other family siblings that left Ireland for Philadelphia were Charles McNulty and Annie McNulty. While working as a domestic, Bridget corresponded through the mail with Edward John Cassidy, a childhood friend from Donegal, Ireland, now living in San Francisco. They wrote love letters, Edward proposed and the Tiffany set diamond ring was sent through the mail. Bridget left “Philly” in 1917 and took the train to San Francisco, and stayed at “Aunt” Sarah’s on Liberty Street. Edward John and Bridget Christine were married on May 28, 1917 at St. Peter’s Parish in San Francisco. During the Depression years, Bridget did catering for influential people for special occasions and sometimes daughter, Anne went along and helped do dishes. Mother Bridget worked as a cook and housekeeper for the Chipman family, who had a country estate in San Carlos, called Hidden Valley. Once again, Anne was the lucky one who was able to go with mother. It was a lovely place with horses, tennis courts, and a croquet area among the trees. The Chipman’s were very good to Anne and for her birthday, took her to a novelty store where she selected Mexican Jumping beans! During the night the beans got active and Mother and Anne were up searching, looking for rats! One time when Bridget was working in the Cadillac Laundry, in which Edward had a partnership, Mother noticed she was missing the diamond out of her engagement ring. After a frantic search for hours, the diamond was found in an extractor (like a dryer). While working in the laundry, in 1936 Bridget had the opportunity to return to Ireland with a lady friend. Both Bridget and Edward worked very hard to provide for a family of four children. They had a summer home in Fairfax and Mother commuted to S.F. each day, worked all day in the laundry and returned to Fairfax five nights a week. She purchased a few groceries in town and then trudge at least one mile and the100 stairs to be with her children each night. (Bridget never drove a car.) Dad would come over on weekends and repair all the things that we broke during the week. His only relaxation time was the auto ferry ride from Sausalito to S.F. When the Cassidy family lived in the California Street apartment house, Bridget used to go to the Aquatic Park. Bridget loved the beach and soaking her feet in the ocean. Some fisherman on the pier had caught a crab and was about to throw it back into the water when Bridget asked for it. She put a string around the live crab, boarded the streetcar on Van Ness and rode back to the apt. house. Due to failing health, Edward sold his share of the laundry and they bought an apartment house at 1650 California St. Mom and Dad did most of the maintenance work on the apt. building. Pat, Regina and Anne were married from that address. Later they downsized to a smaller building in the Richmond district after Regina was married. In 1948 Bridget and Edward made their only trip back to Ireland together and they seemed to enjoy it very much. Bridget and Edward retired to Glen Ellen, California to enjoy the country life. By this time there were grandchildren and they liked to see them come and go. Their modest Victorian was located on Arnold Drive with a creek that ran behind the property and old oak trees that provided a lovely canopy of shade. Bridget was a driven, hard working, loving mother, but not without a thirst for alcohol, much to Edward’s chagrin. This caused much havoc and unsettled conditions until she found the then obscure AA and attended meetings with her son, Frank, who later found his sobriety. Edward died in September 1952, and a few years following, Bridget sold her retirement home in Glen Ellen and the Bill Pluckebaum (Regina) family purchased a home in Los Gatos with a separate apt. in the back for Bridget (Grandma). She joined the family for most of her meals and finally the four teenagers were more than her nervous system could handle. Grandma moved to an independent living near the beloved beaches, water and boats, in Santa Cruz. She was unable to care for herself and eventually moved to assisted living, Our Lady’s Home in Oakland, where she was visited by family frequently. On April 4, 1976, she slipped quietly into eternal peace with the Lord. At the time of her death, Bridget was survived by her 4 children, Patricia O’Callaghan/Oman, Frank J. Cassidy, Anne Timmer and Regina Pluckebaum. She was the loving grandmother to 24 grandchildren and great-grandmother to 12. There was a mass at St. Anne’s Church in S.F. and interment at Holy Cross Cemetery, south of S.F. where she was buried with her beloved Edward John, in the Cassidy plot. Born: around 1850-1865 in Pennsylvania, U.S.
Charles or “Chas” was a horseman, buying, selling and trading of horses at the market in Ireland. He was also a farmer. He was a naturalized citizen of the United States, born in Pennsylvania, to Irish parents. His family returned to Ireland when he was still a child. As an adult he returned to the United States and stayed only a few years. He spent most of his life in Ireland raising his family. He possibly re-married after his first wife died in childbirth around 1902. Bridget was a beautiful and hard working woman. She was born in a thatched cottage that was built around 1750. It is no longer standing, but we do have a lovely photograph of it. Bridget grew up in this home and in turn died in it while giving birth to her last child. Little is known of Bridget, how she met Charles, her life,… except childbirth was difficult and she ultimately died giving birth, but after having several children. “Denis” Separated at 10 years of age when their mother died giving birth to a younger sibling.